By Brian J. Rogal | August 23, 2018 at 02:45 a.m.
CHICAGO—After years of record-breaking construction, it’s getting tough to find places in tight infill submarkets suitable for new industrial construction. But some developers believe opportunities still exist. A joint venture between PCCP, LLC and Midwest Industrial Funds just acquired and began the value-add repositioning of a vacant 490,000-square-foot warehouse in Hodgkins, IL now known as Hodgkins Center of Commerce. Upon completion, company officials say the property, located at 6600 River Rd., will provide an attractive, large block of space at a discount to new construction and benefit from its positioning as one of the largest infill, distribution facilities available in the market. 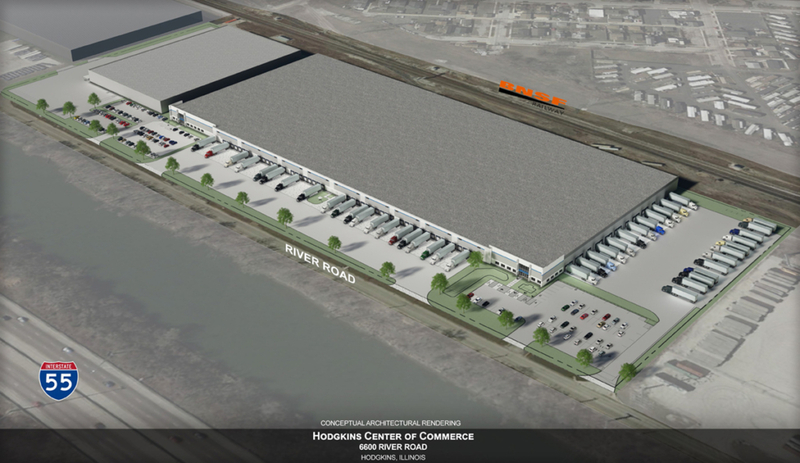 “With developers and tenants struggling to find infill land or space close to Chicago, we believe that the fully renovated distribution facility will be met with strong user interest,” says Jim Galovan, partner with San Francisco-based PCCP. The 26’ clear height building was fully occupied for 40 years and only recently vacated. by its latest tenant. The venture’s plans for the insulated metal panel warehouse includes tearing down part of the building to make way for 45 additional exterior docks and a 60’ speed bay. It will also add a new precast and glass façade, new office space, a more modern fire suppression system as well as a new roof and HVAC systems. The finished product will have approximately 408,000 square feet suitable for one or two tenants. Hodgkins is sandwiched between full interchanges on I-55 and I-294, and has easy access to the Chicago CBD, both O’Hare and Midway Airports, several major intermodal yards nearby, as well as having immediate access to UPS’s 240-acre CACH facility, one of its largest sorting facilities. Furthermore, the infill site benefits from a strong nearby labor force and limited competition in a sub-5% vacant submarket.